Evelyn De Morgan English pronunciation: /iːv/lən də/mɔːrgæn/ (30 August 1855 – 2 May 1919) was an English painter whose works were influenced by the style of the Pre-Raphaelite movement. 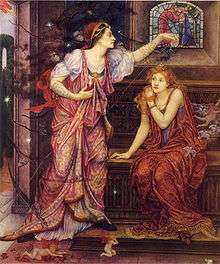 She was a follower of Pre-Raphaelist Edward Burne-Jones. Her paintings exhibit spirituality; use of mythological, biblical, and literary themes; the role of women; light and darkness as metaphors; life and death; and allegories of war. She was born Mary Evelyn Pickering at 6 Grosvenor Street, to upper middle class parents Percival Pickering QC, the Recorder of Pontefract, and Anna Maria Wilhelmina Spencer Stanhope, the sister of the artist John Roddam Spencer Stanhope and a descendant of Coke of Norfolk who was an Earl of Leicester. Evelyn was educated at home and started drawing lessons when she was 15. On the morning of her seventeenth birthday, Evelyn recorded in her diary, "Art is eternal, but life is short…" "I will make up for it now, I have not a moment to lose." She went on to persuade her parents to let her go to art school. At first they discouraged it, but in 1873 she was enrolled at the Slade School of Art. She was granted a scholarship at Slade which entitled her to three years of financial assistance. However, since the scholarship required that she draw nudes using charcoal and she did not care for this technique, she eventually declined it. She was also a pupil of her uncle John Roddam Spencer Stanhope, who was a great influence on her works. Beginning in 1875, Evelyn often visited him in Florence where he lived. This also enabled her to study the great artists of the Renaissance; she was particularly fond of the works of Botticelli. This influenced her to move away from the classical subjects favored by the Slade school and to make her own style. She first exhibited in 1877 at the Grosvenor Gallery in London and continued to show her paintings thereafter. In August 1883 Evelyn met the ceramicist William De Morgan, and in 5 March 1887, they married. They spent their lives together in London. 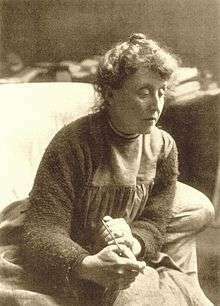 De Morgan, a pacifist, expressed her horror at the First World War and South African War in over fifteen war paintings including The Red Cross and S.O.S. Relative to artistic pursuits, money was unimportant to the De Morgans; any profits from sales of Evelyn's paintings went toward financing William's pottery business and she actively contributed ideas to his ceramics designs. Two years after his death in 1917, she died on 2 May 1919 in London and was buried in Brookwood Cemetery, near Woking, Surrey. In August 1875 Evelyn sold her first work Tobias and the Angel. Her first exhibited painting, St Catherine of Alexandria was shown at the Dudley Gallery in 1876. In 1877, Evelyn exhibited two works at Dudley Gallery (for sale) and is invited to exhibit at the first Grosvenor Gallery exhibition. In October 1991, sixteen canvases were destroyed in a fire at Bourlet's warehouse. Aurora Triumphans (1877–78 or c. 1886), Russell-Cotes Museum, Bournemouth. Love, the Misleader (1889), private collection. Medea (1889), Williamson Art Gallery, Birkenhead. Angel of Death (1890), private collection. Life and Thought Emerging from the Tomb (1893), Walker Art Gallery, Liverpool. Eos (1895), Columbia Museum of Art, Columbia, South Carolina. Angel of Death (1897), private collection. The Vision (1914), private collection. Her works are held in Walker Art Gallery, Liverpool; National Trust properties Wightwick Manor and Knightshayes Court; Russell-Cotes Art Gallery and Museum, National Portrait Gallery; Southwark Art Collection. 1 2 3 Secondo, Joellen. "De Morgan". Grove Art Online. Oxford Art Online. Oxford University Press. Retrieved 7 March 2015. (subscription required (help)). 1 2 3 4 Lawton Smith, Elise (2002). Evelyn Pickering De Morgan and the Allegorical Body. Fairleigh Dickinson Univ Press. ISBN 978-0-8386-3883-5. 1 2 3 Gordon, Catherine (1996). 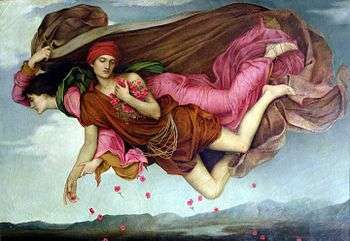 Evelyn de Morgan: Oil Paintings. De Morgan Foundation. p. 14. ISBN 978-0-9528141-0-8. 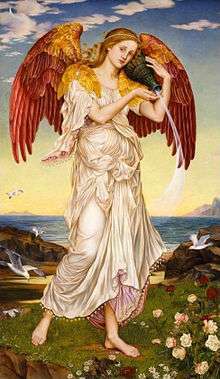 ↑ "Aurora Triumphans (1877-8) oil painting by Evelyn de Morgan (1855-1919) returns to Bournemouth". Russell-cotes.bournemouth.gov.uk. Archived from the original on 1 November 2010. Retrieved 2010-11-20. ↑ Lawton Smith, Elise (2002). Evelyn Pickering De Morgan and the Allegorical Body. Fairleigh Dickinson Univ Press. p. 241. ISBN 978-0-8386-3883-5. Drawmer, Lois Jane (2001). 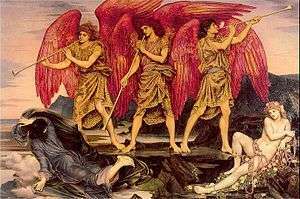 The impact of science and spiritualism on the works of Evelyn De Morgan 1870-1919 (PhD). Buckinghamshire New University. Marsh, Jan; Nunn, Pamela Gerrish (1989). Women Artists and the Pre-Raphaelite Movement. Virago. ISBN 978-0-86068-065-9. Marsh, Jan; Nunn, Pamela Gerrish (1997). Pre-Raphaelite women artists. Manchester City Art Galleries. p. 139. ISBN 978-0-901673-55-8. Wikimedia Commons has media related to Evelyn de Morgan.